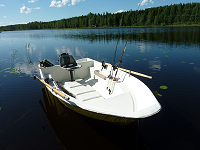 Cottage Accommodation for Winter 2019 Fishing Holidays in Finland! 7 – 13 January 2019, 900 € / week (mon – sun), weekend 450 € (fri - sun), long weekend 550 € (thu-sun or fri-mon), workweek 450 € (mon - thu). 14 January – 17 March 2019, 650 € / week (mon – sun), weekend 400 € (fri - sun), long weekend 500 € (thu-sun or fri-mon), workweek 400 € (mon - thu). 18 March – 28 April 2018, 750 € / week (mon – sun), weekend 400 € (fri - sun), long weekend 500 € (thu-sun or fri-mon), workweek 400 € (mon - thu). 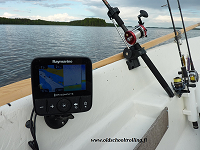 Dates 18 March - 21 April are the best for spring time ice fishing on Lake Saimaa. 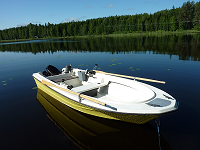 Cottage Accommodation for Spring & Summer 2019 Fishing Holidays on Lake Saimaa! 29 April – 2 June 2019, 900 € / week (mon – sun), weekend 450 € (fri - sun), long weekend 550 € (thu-sun or fri-mon), workweek 450 € (mon - thu). 3 June – 16 June 2019, 1000 € / week (mon – sun), weekend 500 € (fri - sun), long weekend 600 € (thu-sun or fri-mon), workweek 500 € (mon - thu). 17 – 23 June 2019, 1100 € / week (mon – sun), weekend 650 € (fri - sun), long weekend 800 € (thu-sun or fri-mon), workweek 550 € (mon - thu). 24 June – 7 July 2019, 1000 € / week (mon – sun), weekend 500 € (fri - sun), long weekend 600 € (thu-sun or fri-mon), workweek 500 € (mon - thu). 8 – 21 July 2019, 1100 € / week (mon – sun). 22 July – 11 August 2019, 1200 € / week (mon – sun). 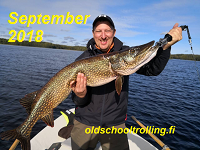 12 August – 1 September 2019, 1100 € / week (mon – sun). 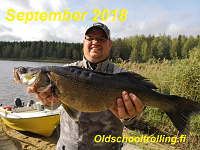 Cottage Accommodation for Autumn 2019 Fishing Holidays in Finland! 2 – 15 September 2019, 1000 € / week (mon – sun), weekend 500 € (fri - sun), long weekend 600 € (thu-sun or fri-mon), workweek 500 € (mon - thu). 16 September – 13 October 2019, 950 € / week (mon – sun), weekend 500 € (fri - sun), long weekend 600 € (thu-sun or fri-mon), workweek 500 € (mon - thu). 14 October – 10 November 2019, 900 € / week (mon – sun), weekend 500 € (fri - sun), long weekend 600 € (thu-sun or fri-mon), workweek 500 € (mon - thu). 11 November – 1 December 2019, 800 € / week (mon – sun), weekend 450 € (fri - sun), long weekend 550 € (thu-sun or fri-mon), workweek 450 € (mon - thu). Prices are including linen fees and cost of final cleaning for max. 6 persons. 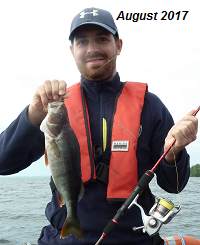 Fishing licenses 15 euros / fisherman / 7 day period(one rod & lure). No pets or smoking inside the house. Net fishing prohibited. • Fishing trip 4 hours. Price 350 euros. Max. 4 persons. • Fishing trip 6 hours. Price 500 euros. Max. 4 persons. • Fishing trip 8 hours. Price 650 euros. Max. 4 persons. Packed Picnic on Boat or Picnic by Campfire? 1) Having picnic on the boat. Includes packed picnic and coffee and tea in thermos flasks. 2) Having picnic around an open fire. Includes packed lunch as well as coffee, tea and sausages cooked on the open fire. 3) Longer lunch around an open fire. Includes packed lunch as well as coffee, tea, sausages and vendace (local small and tasty fish) cooked on the open fire. For dessert we will make pancakes with jam. The prices of the lunches start from 50 Euros. The packed lunch includes for example bread, Karelian rice pasties, bread spread, cold cuts, cheese, cucumber and tomatoes. 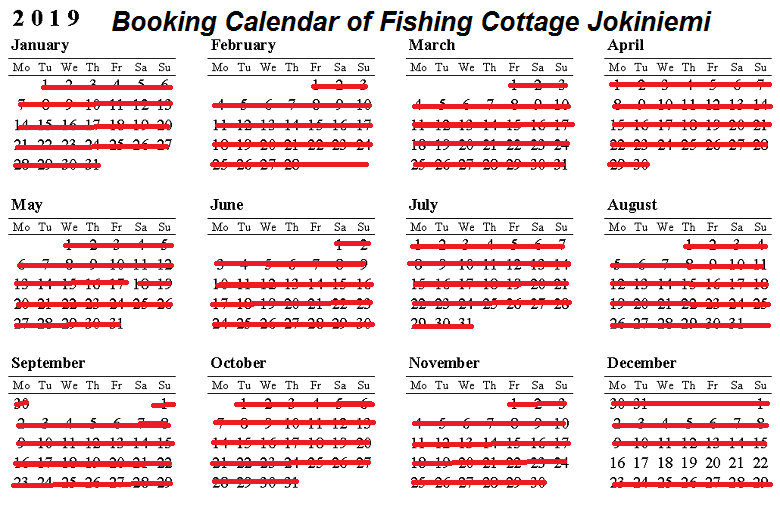 The prices for a guided ice fishing day of max. 6 hours are starting from 200 euros / group). Find prices is our winter site. In the year 2016 we welcomed fishermen groups visiting our cottage from Finland, Lithuania, Latvia, Germany, France, Great Britain, Israel, Russia and the Czech Republic. In the year 2017 we welcomed fishermen groups visiting our cottage from Belarus, France, Netherland, Russia, Lithuania, Latvia, Israel and the Czech Republic. In the year 2018 we welcomed fishermen from Latvia, Israel, Russia, Romania, Switzerland, Lithuania, Belarus, Ukraine and Sweden. 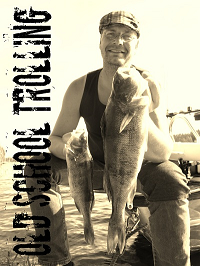 Follow our Blog or Facebook sites for fishing reports of our visitors. For the year 2019 we already have bookings from Latvia, Lithuania, Israel, Russia, Romania, Switzerland, Japan and the Czech Republic. 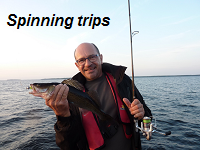 Follow our Blog or Facebook sites for fishing reports of our visitors.